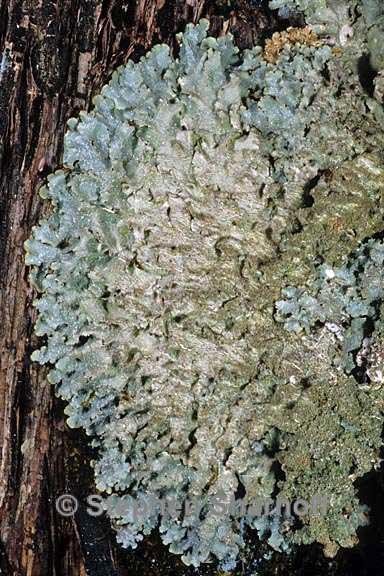 Thallus: foliose, medium sized, to 8 cm; lobate lobes: plane, linear to subirregular, spreading, 4-7 mm upper surface: bluish gray to light mineral gray, shiny, sometimes cracked; margin: tinged with brown, rarely pruinose pseudocyphellae: white, common, irregular in shape, sometimes coalescing isidia: occasional to frequent, short, smooth and corticate, simple to forked or coralloid, brown-tipped, often arising from pseudocyphellae and cortical cracks, not breaking up into soredia-like masses, occasionally becoming extremely dense and "mounded" obscuring the thallus lobes lower surface: pale, white to flesh-colored or more brown; rhizines: simple to forked, concolorous with the lower surface or white Apothecia: very rare and immature in Sonoran material Pycnidia: not seen in Sonoran specimens Spot tests: upper cortex K+ yellow, C-, medulla K-, C+ red Secondary metabolites: upper cortex with atranorin (minor), medulla containing lecanoric acid (major). Substrate and ecology: on rocks (basalt, rhyolite, volcanic) and mosses, or bark (Quercus, Pachycormus, Pinus), 10-2260 m in the Sonoran region World Distribution: widespread, common in North America, Europe, Asia and Australia; (unknown in Antarctica) Sonoran distribution: infrequent in Arizona and occasional in Baja California, Chihuahua, Durango and Sonora. Notes: This species is extremely common and widespread in eastern and southeastern North America (Brodo et al. 2001).